How does one recognise a good quality rim door lock? Rim door locks are mainly used to secure gates, garage doors, industrial doors, cellar doors etc. They are relatively simple locks, but by no means are they all the same. Several features can make the difference between a lock that does its duty and one that exposes us to considerable risks, which are completely avoidable. In order to resist any malicious attacks, the lock case and the striker plate must each be made from a pressed shell (using the drawing process) without cracks or joints. The cheaper products are, on the other hand, made simply by bending the metal sheet, resulting in pieces which have cracks and/or seams at the edges, which greatly decrease the resistance. Cases and striker plates made of bent metal sheets are easily deformable. The best locks have brass cylinders, which is a material that ensures durability and mechanical strength. However, low-cost products have cylinders made of cheap alloys which, since they are very brittle, are not able to provide the necessary resistance even to the simplest of brute-force attacks. Mechanical strength is an essential requirement also for the latches and dead-bolts, which are the components most highly stressed by attempts to break in, and they must be made of brass or stainless steel and not with a lightweight alloy . In poor quality products they are often made of zamak alloy, possibly with a brass polished finish, to make it look like brass. In good quality locks, if the dead-bolt encounters resistance to moving forward (for example, because it is not aligned with the striker plate, or this is blocked), the key fails to turn, thus highlighting the problem. However, in products with imprecise mechanisms, the key is still able to turn, skipping the throw. One therefore has the impression that the throw has been completed, even though the dead-bolt has not actually moved forward. In this case it is possible that the door remains open even when you are convinced you have closed it, thereby creating a serious security issue. The internal components must be galvanized to prevent moisture from rusting them, which would render the lock unusable. Rust can also attack the outer body. In order to withstand moisture, locks which are mounted outside, and are therefore subject to adverse weather conditions, must have the body galvanized as well as, possibly, being painted. Indoors it is sufficient to use bodies which are simply painted. 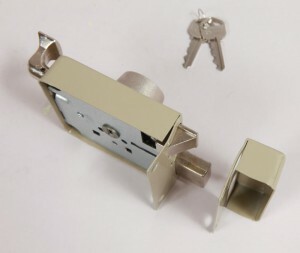 A Viro lock with galvanized body. 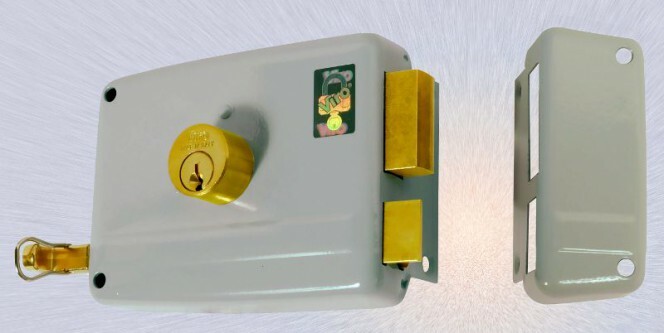 As always, the level of security of a lock also depends on how it is mounted. In a future post blog will see how to choose and correctly install a rim door lock. This entry was posted in Locks and Cylinders and tagged tips on 1 August 2013 by Mara Rossi.